A Retractable Awning installed over your patio, porch or deck will expand your outdoor living area allowing you to enjoy sunshine when you want it and shade when you don’t. Designed to be complimentary to your outdoor area, we offer durable and functional exterior shade systems designed to outsmart the weather. & enhance the art of outdoor living! We offer manual or motorized awning options. When you opt for our motorized option, your awning is linked to a remote control or wall panel that allows you to make changes with the touch of a button. Remote technology allows you to raise or lower your shades and awnings from anywhere in your home at any time, regardless of the weather or the time of day. Allows you to easily open or close your awning, making it easy to keep your attention and focus on the tasks at hand or the guests you are entertaining without any interruption. Motorized operation of awnings can also offer comfort to individuals who might otherwise have trouble with manual raising and lowering your awning. Those who are older, suffer from arthritis, have been injured, or simply have more limited mobility can greatly benefit from the comfort offered by remote operation of your awning. Or if your one of those people who loves the newest technology and the ease of just pushing a button, a motorized shade is for you! We are pleased to offer motorized retractable awning options. You can take a look at our products by browsing through our online galley, at our showroom or just give us a call at (509) 308.1354 & discuss your needs with our knowledgeable staff. 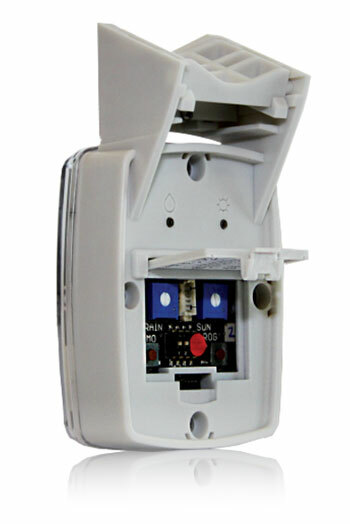 We offer solar powered and wired sun, rain and wind sensors with Radio Technology Somfy®. RTS allows you to experience motorization your way. wall switches, table top controls, timers or app control. automatic control based on weather conditions. Now offering: The first totally wireless rain & sun sensor. • Adjustable rain & sun sensitivity. NO WIRING REQUIRED Mounts flat, on a pole or a gutter. No wiring required! Renewable energy Harnesses solar power while protecting interiors from the sunlight’s harmful rays. • Simple indicators show which function is on. NW Shade Co uses industry leading Southwest Sun Control retractable awnings. Each awning is custom crafted in the USA, using extruded aluminum and a stainless steel chain arm along with Sunbrella Fabrics. These durable and beautiful awnings work well for homes & businesses in the Yakima, Columbia Basin and Walla Walla Valleys. They’ll ensure you enjoy your outdoor living space throughout each season!